A collection of biographical sketches and memories of the Swami by both monastics and lay devotees. In any field of endeavor it is the "Great Ones" to whom we look for inspiration. The spiritual life is no different, and we are fortunate in the Vedanta tradition to have many great souls who have preceded us, but who continue to offer us their teachings, wisdom and help. Swami Tapasyananda was one such guide. 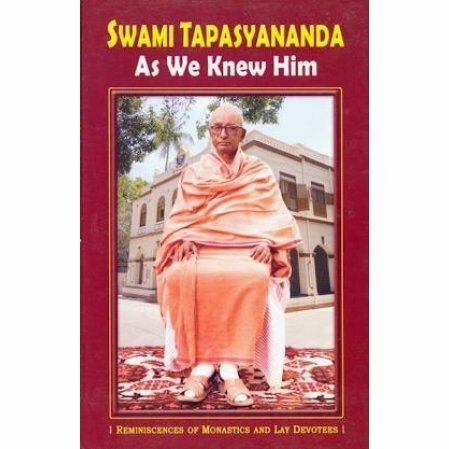 This collection of personal reminiscences and sketches by monastic and lay devotees will give the reader interesting and illuminating insights into the life and personality of Swami Tapasyananda. The values he embodied--a sharp intellect, yet tender heart; high thinking, yet simple living; learned, yet humble; humorous, yet grave; devotional in temperament, yet rational in approach; strict with himself, yet generous with others--are sure to inspire and demand emulation and respect.